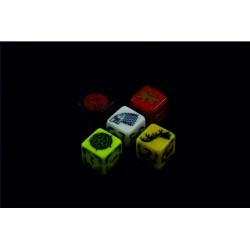 Riot Dice Ci sono 6 prodotti. There is a war, and the throne is the prize for the winner. Choose who will be your winner! What is this messy confusion?! 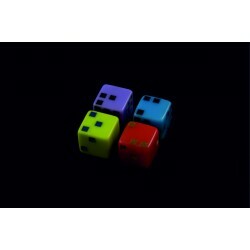 roll those dice and spend a lot of time to comprehend the result!each one of those dice has dots in a different position each other. In addition, their color contrast makes them difficult to be red. There is a hunt in my backyard! She is Cippy, she is looking for the dinner! Close to her, a gray thin cat is walking carelessly and a fat cat is dreaming for a new toy. Any steps further, the alpha, Finger, is patrolling his territory. 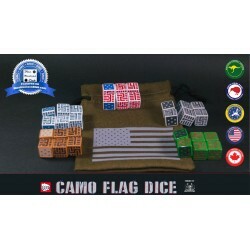 This set contains 4 different dice. 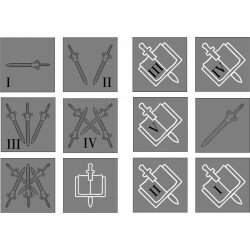 Faces from 1 to 5 have numbers and decorations and the sixth has the same dice and an artwork. 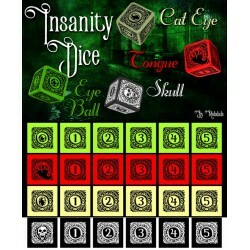 Dice are: Eye Ball: 16mm lime die laser engraved. Black painted. Skull: 16mm black die laser engraved. White paint. Cat Eye: 16mm cream die laser engraved. Black paint. Tongue: 16mm red die laser engraved. Black paint.